[193 Pages Report] The global Industrial Control Systems (ICS) security market size was valued at USD 12.22 billion in 2017 and is projected to reach USD 18.05 billion by 2023, at a Compound Annual Growth Rate (CAGR) of 6.5% during the forecast period. The base year considered for the study is 2017, and the forecast period is from 2018 to 2023. The objective of the report is to define, describe, and forecast the industrial control systems security market by solution, service, security type, vertical, and region. The report analyzes the opportunities in the market for stakeholders by identifying the high-growth segments of the market. It profiles the key players of the market and comprehensively analyzes their core competencies, such as new product launches, partnerships, agreements, and collaborations. The report also covers detailed information about the major factors (drivers, restraints, opportunities, and challenges) influencing the growth of the market. The industrial control systems security market comprises several major providers, such as ABB (Switzerland), Check Point Software (Israel), Cisco (US), Honeywell (US), McAfee (US), FireEye (US), Fortinet (US), BHGE (US), Kaspersky Lab (Russia), Belden (US), Airbus (France), BAE Systems (UK), Bayshore Networks (US), Dragos (US), CyberArk (US), Cyberbit (Israel), Indegy (US), Nozomi Networks (US), Palo Alto Networks (US), Rockwell Automation (US), Schneider Electric (France), SecurityMatters (Netherlands), Sophos (US), Symantec (US), Positive Technologies (US), and Waterfall Security Solutions (Israel). The market stakeholders include ICS security vendors, independent software vendors, consulting firms, system integrators, Value-added Resellers (VARs), and Information Technology (IT) agencies. These Industrial Control Systems Security Software Vendors are rated and listed by us on the basis of product quality, reliability, and their business strategy. Please visit 360Quadrants to see the vendor listing of Industrial Control Systems Security Software. In-depth analysis was performed to get detailed information on the competitors in the industrial control systems security market by tracking their offerings and business strategies. The report reviews the major players offering ICS security technology solutions. In addition, the report outlines the findings and analysis on how well each ICS security technology solution provider performs within MarketsandMarkets’ criteria. The industrial control systems security market study aims to estimate the size and future growth potential of the market across different segments, such as solutions, services, security types, verticals, and regions. The solutions segment includes antimalware/antivirus, Distributed Denial of Service (DDoS) mitigation, encryption, firewall, Identity and Access Management (IAM), Intrusion Detection System/Intrusion Prevention System (IDS/IPS), security and vulnerability management, security configuration management, Security Information and Event Management (SIEM), whitelisting, and others. The encryption solution is expected to grow at the highest CAGR during the forecast period. Encryption solutions help industrial customers in data protection. Encrypting ICS helps mitigate common attacks, such as data thefts and DDoS attacks, and provides high reliability, performance, and availability of the network on-demand. The industrial control systems security market by service has been segmented into consulting and integration services, support and maintenance services, training and development services, incident response services, and managed security services. Among these, the incident response services segment is expected to be the fastest growing in the overall market. The demand for incident response services is increasing, due to the rise in terrorist and cyber-attacks, and the strict security norms followed by governments and international organizations. 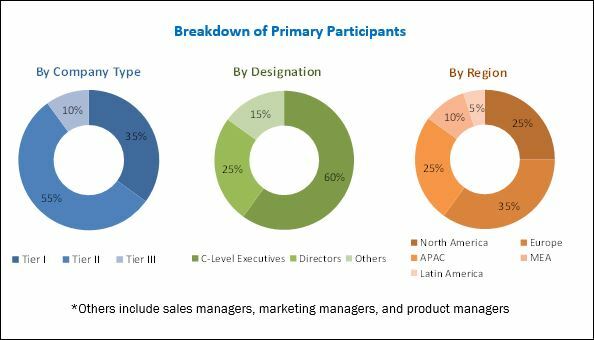 In terms of geographic coverage, the industrial control systems security market has been segmented into 5 regions, namely, North America, Asia Pacific (APAC), Europe, the Middle East and Africa (MEA), and Latin America. North America is estimated to account for the largest market share in 2018. North America is considered the most advanced region in terms of technology adoption and infrastructure. 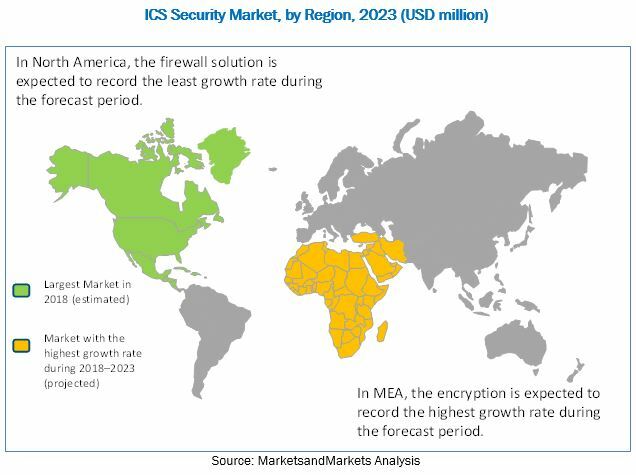 The wide presence of key industry players of ICS security solutions in this region is the main driving factor for the growth of the North American ICS security market. Increased instances of cyber-attacks, reliance on Industrial Internet of Things (IIoT), and rising regulations are driving the market growth in this region. The major restraining factors to the growth of the industrial control systems security market include power outage due to frequent security updates and legacy ICS being more prone to cyber-attacks. Legacy IT security solutions are not able to safeguard systems from industrial threats; hence, there is a need for next-generation cybersecurity solutions that can protect the OT environment. The major industrial control systems security vendors include ABB (Switzerland), Check Point Software (Israel), Cisco (US), Honeywell (US), McAfee (US), FireEye (US), Fortinet (US), BHGE (US), Kaspersky Lab (Russia), Belden (US), Airbus (France), BAE Systems (UK), Bayshore Networks (US), Dragos (US), CyberArk (US), Cyberbit (Israel), Indegy (US), Nozomi Networks (US), Palo Alto Networks (US), Rockwell Automation (US), Schneider Electric (France), SecurityMatters (Netherlands), Sophos (US), Symantec (US), Positive Technologies (US), and Waterfall Security Solutions (Israel). These players have adopted partnerships and new product launches as the key growth strategies to offer feature-rich ICS security solutions to their customers and further cater to regions with unmet needs. *Details on Business Overview, Products & Services, Solutions, Recent Developments, SWOT Analysis, MnM View Might Not Be Captured in Case of Unlisted Companies.